I have always wanted to visit the White Cliffs of Dover. It was on my bucket list before I moved to England. I enjoy scenic hikes and the pictures I had seen looked stunning. It’s such a dramatic contrast between the white of the cliffs and the water. The Dover Cliffs are one of those iconic places like Stonehenge. It’s been a landmark for sailors for hundreds of years and even inspired several songs, the most popular being (There’ll be Bluebirds Over) the White Cliffs of Dover by Vera Lynn. We loved walking along the Cliffs of Dover, but the highlight of our day had to be the tour of the Deep Fan Bay Shelter used during World War II. It was interesting to learn more about the history in addition to enjoying the beautiful landscape. The White Cliffs of Dover exceeded my expectations. If you haven’t already been, you need to go! All the information you need to plan your visit is right here in my Dover Cliffs guide. The Cliffs are 300 feet tall and stretch for 10 miles to the east and west of the town of Dover. This is the narrowest part of the English Channel. France is only a little more than 20 miles away. At some points, our cell phones thought we were in France! The chalk is made up of seashell fragments and the remains of small sea organisms and has streaks of black flint. I was surprised to learn it is soft. The cliff face erodes at an average rate of about half an inch per year. Occasionally, large pieces have fallen off. (If you don’t believe me, check out this example from the Daily Mail). Please be careful near the edge. Julius Caesar landed at Dover in 55 B.C. He was met by armed forces, so he got back onto his ship and traveled to a different shore instead. The National Trust purchased a section of the Dover Cliffs in 2016. Looking back toward the port and the city of Dover from the White Cliffs. Port of Dover – You can see the port from the parking lot. It is one of the busiest passenger ports in the world. Ferries take people to Calais and Dunkirk in France and back. Cruise ships also dock here. It was relaxing watching the ships come and go through the harbor. The sea was calm and I found myself thinking about all the people driving their cars onto the ferry, wondering whether they were just starting out on their journey or going home. Views of the White Cliffs Themselves – The point where you first see the White Cliffs is breathtaking. The contrast of the white of the cliffs against the green grass and blue water of the English Channel was breathtaking. France – On a clear day you can see the coast of France, a little more than 20 miles away. Deep Fan Bay Shelter – The Fan Bay Shelter was used during World War II to protect soldiers from bombing attacks. I highly recommend doing the tour where you get to go down in the tunnels. It was fascinating seeing the tunnels as they were back in the 1940s and hearing the history. 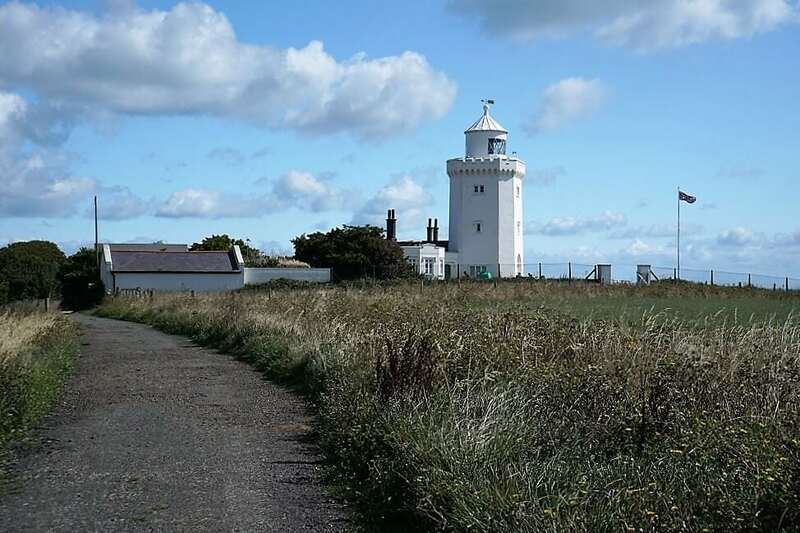 South Foreland Lighthouse – This white Victorian lighthouse is located on top of the Dover Cliffs. We were pleased to find that we were some of the first people to park that day and we had the trails largely to ourselves. From the parking lot, everyone walks east but there are a few different paths you can take. We started out shortly after 9 am and planned to take our time to enjoy the views. We couldn’t dawdle too much though, we needed to still make sure we got to the Fan Bay Shelter before the tours sold out. The views were stunning from the start and kept getting better. 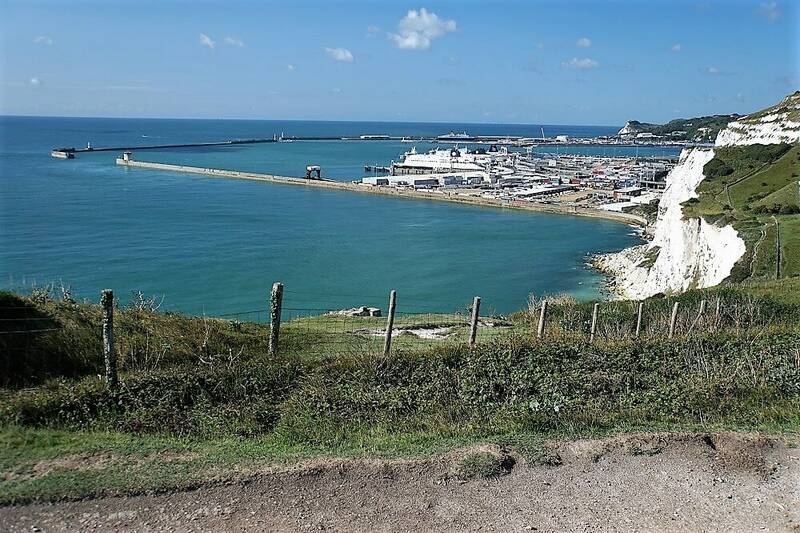 At the start of the walk, we had a clear view of Dover’s port and the Dover Castle on the top of the hill. The green of the hills contrasted against the backdrop of the sea and the clear blue sky. Then, we got our first glimpse of the stark, white chalky cliffs. The white is so bold especially against the green grass and blues from the sea and the sky. Anisa walking along the Dover Cliffs. The paths are well marked. In steep sections, you also have the option to use stairs, which may be easier. Watch out for horse poop though. 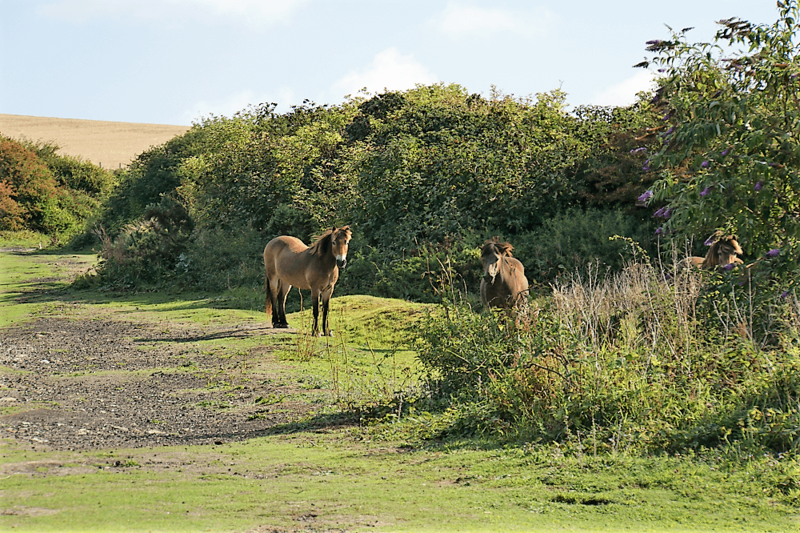 We saw several horses grazing on the cliffs. Note: The National Trust uses the regular browsing of sheep, cattle, and horses to keep the bushes and trees under control and allow the grassland flowers to thrive. There are no railings by the edge of the cliffs. This is wonderful for photos but made me nervous for people who were sitting or standing at the edge. Yes, we saw several people doing this. Personally, when we were walking the White Cliffs of Dover, I made sure not to get too close to the edge and I still had fantastic views. Better safe than sorry! You can turn around at any point, the paths are fine for two way traffic. Many people choose to turn around at the Lighthouse, although the path does continue further. We were taking our time so it took us about 1 ½ hour to get to the lighthouse. I recommend at least walking to the viewpoint about 30 minutes from the parking lot. Before I did the Fan Bay Shelter tour, I couldn’t stop raving about the views from the cliffs. After the tour, I couldn’t stop thinking about the tunnels we had just been in. It was the highlight of our visit! The tunnels are open to the public for tours Friday to Monday from the end of March to the end of October, plus some additional days during the summer. 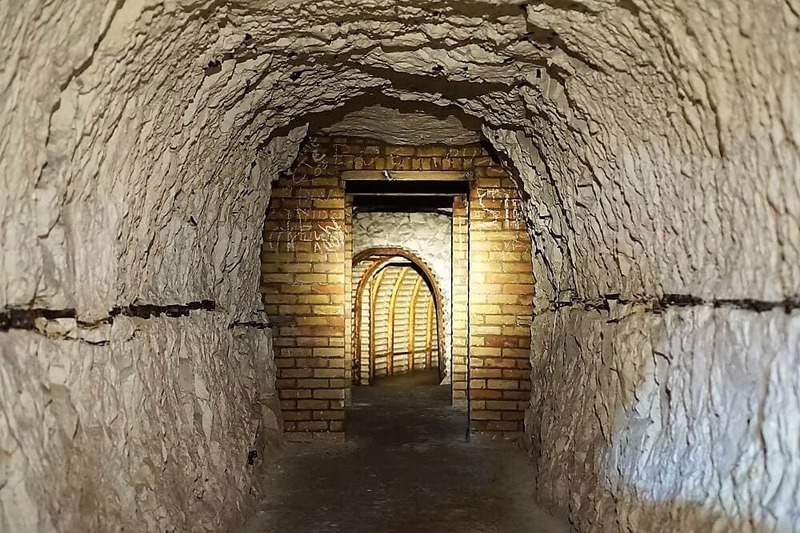 These tunnels were used as a shelter during World War II. Being close to France, Dover was frequently under attack. Over 4,000 shells fell in the area. There were barracks above the tunnels but the soldiers would move into the tunnels during any attacks. At times, there could be almost 200 men inside. The National Trust runs the tours which are led by volunteers. The tours are limited, every 30 minutes from 11 am – 3 pm and they only allow 12 people per tour. I recommend that you get your tickets early before they sell out. The Tunnel Tours cost £10 per person and you must pay in cash at the entrance to the shelter (not the Dover Cliffs Visitor Center). The entrance to the Deep Fan Bay Shelter is located 1 ½ mile from the Dover Cliffs Visitor Center. A glimpse inside the Deep Fan Bay Shelter. The Deep Fan Bay Shelter tour can last anywhere from 30 minutes to 1 hour depending on the number of questions. National Trust members can take the tour for free. Click here to get more information about National Trust Membership. For overseas visitors, there is the National Trust Touring Pass which allows you to visit all the National Trust properties for free for either 7 or 14 days. Click here to learn more about the National Trust Touring Pass. We have our hard hats on, ready to go down in the tunnels. You should be aware that in order to get to the tunnel, you have to climb down 125 steep steps. Of course, you also have to climb up the steps to get out! For safety reasons, they require that you wear proper footwear, so no heels or sandals. They will also give you a hard hat with a light. Children under 12 are not allowed on the tour. The descent into the tunnels was a bit scarier than I anticipated. The steps were steep and it was dark. There was a handrail to hold on to on one side. The stairs were broken into three flights and we took a short break after each one. Our tour guide reminded us that when the soldiers were ordered to move to the tunnels they would be running down these stairs carrying all their stuff including their guns. 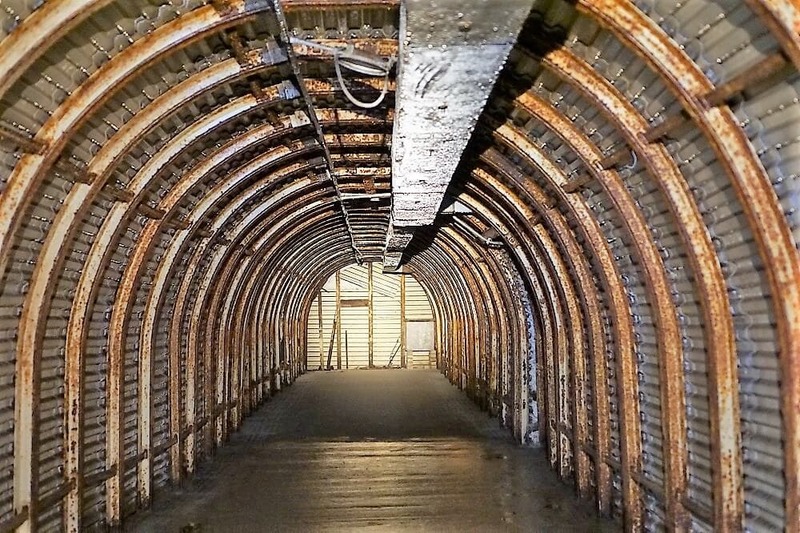 Note: The Deep Fan Bay Shelter should not be confused with the Secret Wartime Tunnels at Dover Castle which were the headquarters for Operation Dynamo. 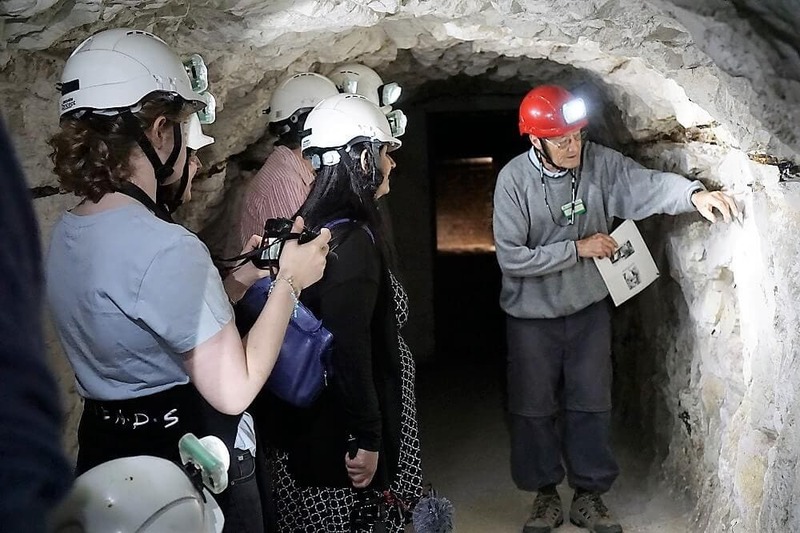 Read more about the Wartime Tunnels at Dover Castle. Our tour lasted a good hour, but the time flew by because it was fascinating. I enjoyed hearing the stories of the soldiers in the tunnels during the war. It was funny to learn that after the tunnels were no longer needed for the soldiers, local kids would have fun in the tunnels (before the National Trust took over). They thought it was a cool place to sneak a drink. It was also thought-provoking to think of the quality of life inside the tunnels for the soldiers. The way our guide described it I could almost smell the bad odors. When the area was under attack, you might find almost two hundred men in bunk beds lining these tunnels. There were only four bathrooms for the soldiers. The four officers, on the other hand, shared their own room. They also had two bathrooms for themselves. Our tour guide was amazing! We learned so much. The graffiti inside the tunnels was fascinating too. The National Trust has identified and studied thousands of pieces of graffiti in these tunnels. Our guide showed us some from the 40s that were of particular interest and others that were more recent. He joked that a lot of the wartime graffiti was probably done waiting in line for the bathrooms. We also learned about how the tunnels were built. It was impressive that it only took three months. I didn’t realize that chalk is actually a soft rock. When the National Trust took over, volunteers did all the work to help restore the tunnels. They did an amazing job and the tour was excellent. I felt like I got a sense of what the shelter was like during the war. 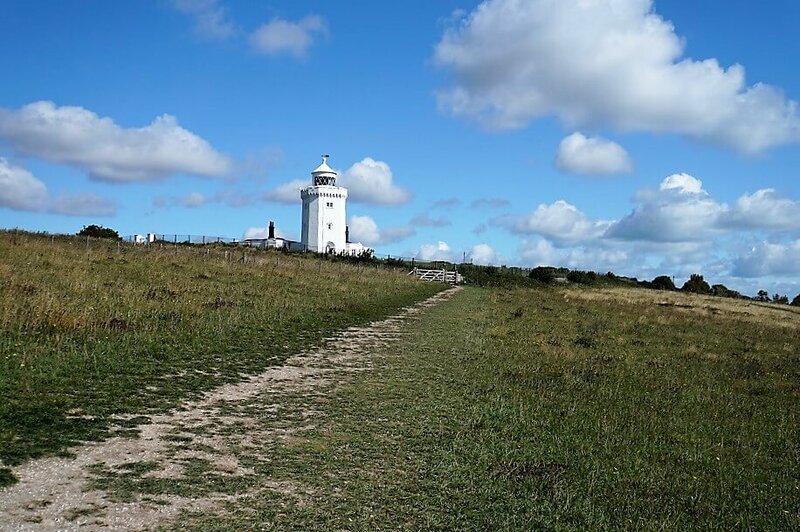 There has been a light at South Foreland since the 14th century when Brother Nicholas de Legh hung a lantern from the cliff to guide ships to safety. The current lighthouse is Victorian, rebuilt in 1846. It is historically significant because it was the first lighthouse in the world to use an electric light. On September 30, 1988, it was decommissioned. You can learn more about the history of the South Foreland Lighthouse and experience the amazing views on the guided tour. Guided tours of the lighthouse run from 11 am to 5 pm, April through October, and cost £6 per adult. The tours last for 30 minutes. If you are a National Trust member, you can take the tour for free. Click here for more information about National Trust membership. The view as we approached the lighthouse. Wouldn’t it be neat to stay in the keeper’s cottage? At the lighthouse, you will also find a cafe, gift shop, and bathrooms. They had picnic tables outside, the perfect place for our snack. We relaxed at one of the tables and took in the views before we walked back to the Fan Bay Shelter. The sea was calm and shimmering in the sunlight. I could have sat there all day! It reminded me a bit of the Neist Point Lighthouse, although the one in Dover is much better maintained. Through the National Trust, you can actually stay at the old lighthouse keeper’s cottage. It’s been transformed into an elegant two bedroom holiday house. Image waking up to the views of the cliffs and the English Channel. Then, stepping right outside and having 66 miles of coastal hiking trails. The village of St. Margaret’s a 20-minute walk away. Click here to get more information about the cottage including pricing and availability. You do not need to be a National Trust Member to stay at the cottage. While you can eat at the cafe at the White Cliffs of Dover Visitor Center or the Lighthouse, I think the cliffs are also the perfect spot to picnic. Why not pack a picnic lunch or snack? It’s hard to beat the views and it’s an easy way to save money. There are picnic tables in the parking lot overlooking the port in addition to the picnic tables by the lighthouse. You can also bring a blanket and find a grassy spot along the trail. We even saw some people sitting on the cliff edge, which I do not recommend. 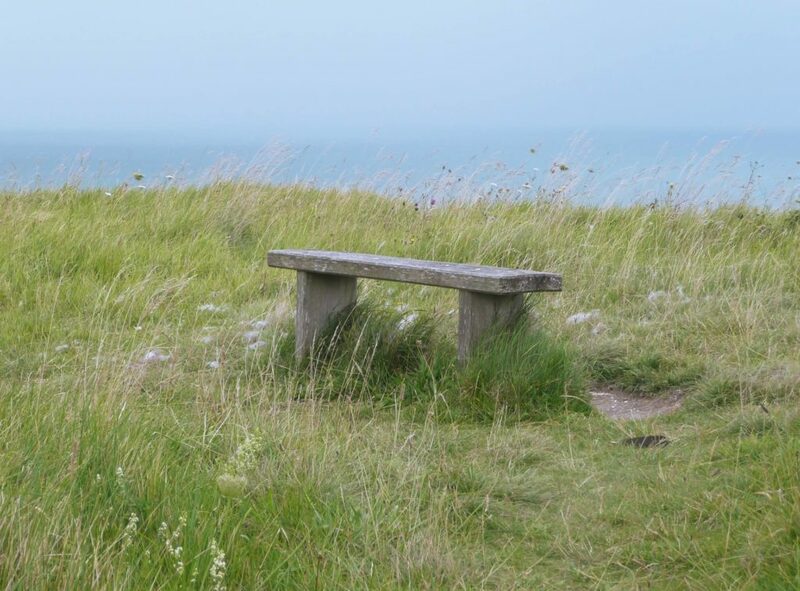 There are also several benches along the trails if you need to rest or just want to sit down while enjoying the view. The Cliffs of Dover are definitely at their best on a clear day. The views are spectacular. I know the weather in England can be unpredictable, but if you can be flexible and visit on a nice day, you will get more out of it. Also, note that the Deep Fan Bay Shelter and the South Foreland Lighthouse are not open all year. You will want to plan your visit April-October on days when the Tunnel (Click here to check if the Fan Bay Shelter is open) and Lighthouse (Click here to check if the South Foreland Lighthouse is open) are open. You also want to go early. The White Cliffs are popular and will get crowded, especially if the weather is nice. We got there when the parking lot opened at 9 am. It was almost empty! The Visitor Center was not even open. The Visitor Center does have bathrooms and a small cafe. The White Cliffs of Dover would make an excellent day trip from London. Dover is in the county of Kent in the southeastern part of England. You have a few options to travel the 79 miles from London to the Cliffs of Dover. Drive! The drive from London to the Cliffs takes about 2 hours. Use the postcode CT15 5NA then follow the brown signs. There is a parking lot run by the National Trust. It is open from 9 am to 7 pm and costs £4. National Trust members park for free. Click here to get more information about joining the National Trust. Train! The train from London St. Pancras Station to Dover Priory takes a little more than an hour. The one thing you need to keep in mind is that the distance from Dover Priory to the White Cliffs is about two miles. You will be walking a lot once you get to the Cliffs, so you may want to save your legs and take a taxi from the station. Be sure to book your train ticket in advance and choose specific train times to get the best price. Click here to check the schedule and pricing. Tour! There are several tour options that will take you from London to the White Cliffs. They combine seeing the cliffs and seeing other places in Kent like Canterbury. 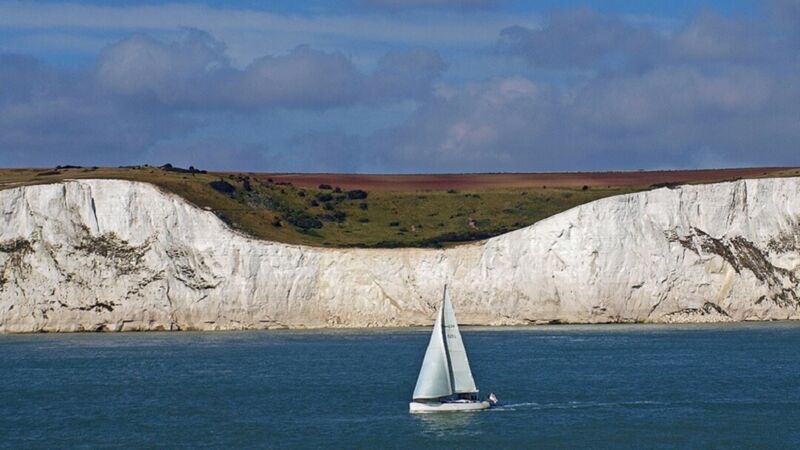 Click here to check out the different tours of the White Cliffs of Dover from London. It’s not a difficult hike so you don’t need any serious hiking gear, but you should wear tennis shoes or something similar especially if you want to do the Dover Cliffs Tunnel Tour. It’s also a good idea to bring water to make sure you stay hydrated. This reusable bottle is good for the environment and will help keep your water cold. If you are lucky with the weather like we were you are going to want your sunglasses! I forgot mine. It’s also always a good idea to wear some sunscreen. You will be outside most of the time and there is little shade on the White Cliffs. If you think it might rain, I would recommend a waterproof jacket over an umbrella because it can get pretty windy. Also, if you plan on doing the Deep Fan Bay Shelter tour, it does get chilly down there, so I would recommend bringing your sweater even on a warm day. You definitely need a camera to capture the beautiful scenery. Please don’t forget your camera! We use the Sony A6000, which is a mirrorless camera, for photos and the GoPro Hero 5 Black for videos. (Read this great post from TravelFreak to learn more about mirrorless cameras) The GoPro is waterproof so you can use it even if it rains. Keep in mind that the GoPro has a fisheye lens. Last but not least, bring along some snacks (or even a picnic lunch). We don’t want anyone getting hangry! We thoroughly enjoyed our time exploring the White Cliffs of Dover. It exceeded my expectations. We were lucky to get amazing weather so the views were incredible. The highlight, though, was the Dover Cliffs tunnel tour. Check out our White Cliffs of Dover video so that you can see what it is like. Have you ever visited the White Cliffs of Dover? I would love to hear about your experience. Go early. It will be less crowded and you want to make sure you get tickets for the Dover Cliffs Tunnel tour. Plan your visit for April to October on days when the Tunnel and Lighthouse are open. Don’t forget your camera. The views of the cliffs and looking out on the Channel are breathtaking. Wear proper shoes. 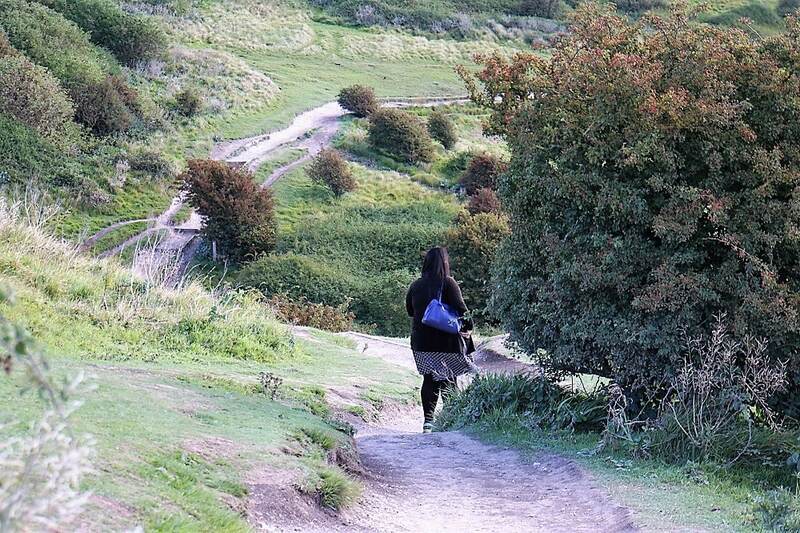 The Dover Cliffs walk is not a difficult hike, but there are steep sections. They also require proper shoes to go into the Fan Bay Shelter. Consider joining the National Trust. National Trust members can take the tunnel tour, lighthouse tour, and park for free. This would save £16 per adult and the £4 to park if you are driving. Click here for more information about becoming a National Trust member. I wanted to see the Dover Cliffs for a long time, though I haven’t made it yet. They look gorgeous next to the water. I can’t believe they are eroding so fast; I would not get close to the edge, and like you, I’d be nervous for people who do. Thanks for the tour. 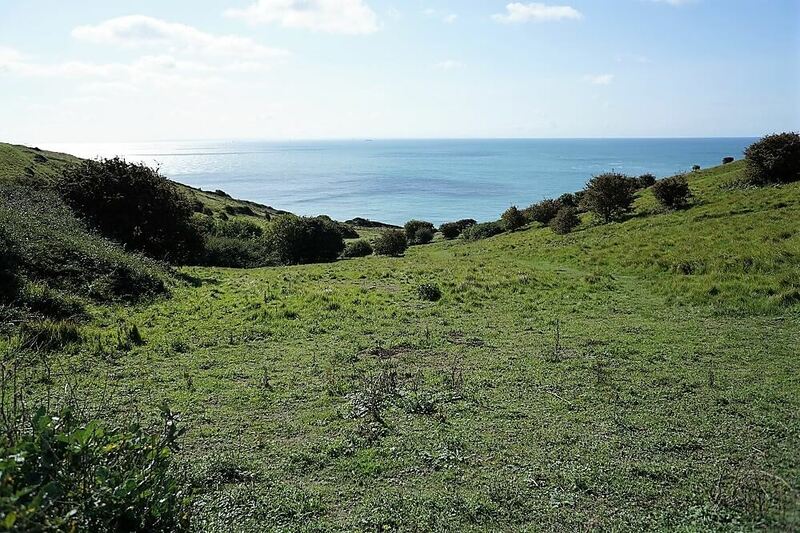 Emese – I hope you get the chance to go to the Dover Cliffs. I am glad I am not the only one scared of the edge! Suzy – Thank you! I think you have only been able to go in the tunnels the last few years since the National Trust has taken over. It’s definitely worth a return visit. Always love visiting this part of England, the hiking trails with those views are some of the best in the country. I’m always surprise how close you can get to the edge with such a big drop, makes my knees tremble a bit even just thinking about it now! Paul – Yes, it is a beautiful part of the country. I got nervous just watching other people close to the edge! Wow! This looks so fabulous! From the cute horses to the great sea views, this place has it all. I had no idea that you could tour tunnels from World War II here as well. I bet the history is just fascinating. Thanks for the share, I’ll be saving your post for future reference. Michelle – Yes, it is a lot more than just a beautiful spot with a view. I hope you get the chance to visit. I recently saw a documentary on Dover Cliffs tunnels but until then I knew nothing about it – looks really fascinating. Yes, the tunnels were fascinating. I had no idea about them until I starting planning my trip. You always go to the coolest places!! I’m super jealous of the fact that you live in England! It is so beautiful there!! One day I will see it, I hope. Thanks Amanda. Yes, I have been enjoying exploring my new home. I have been surprised about how many amazing places there are here. Great piece! 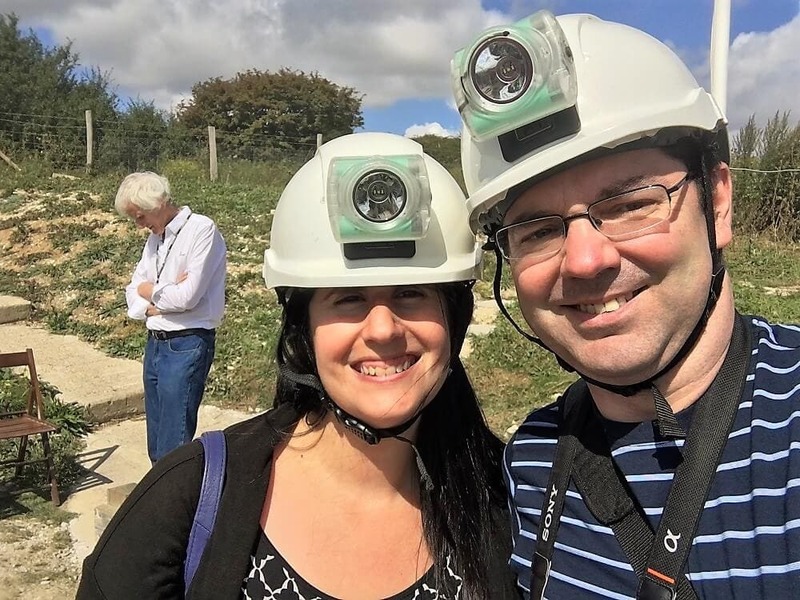 We love exploring the U.K. and the White Cliffs of Dover are a great location to enjoy – who knew there was so much to enjoy here 🙂 Thank you for sharing. Karen – Thanks. I hope you get the chance to go to Dover. Catherine – I agree. The Cliffs are just one attraction. I loved the castles too. I need to go back for the museum. 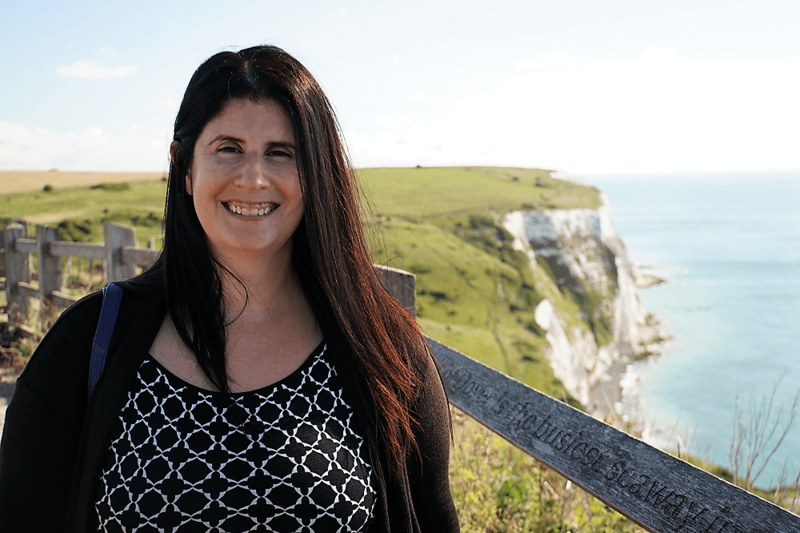 Kat – I hope you get the chance to visit the White Cliffs of Dover and get as lucky with the weather as we did! I’ve heard so many good things about the White Cliffs of Dover. I hope I’ll get to visit them someday and get as good weather as you did. Thanks for sharing these tips. Do you think it’s worth becoming a National Trust member even if you are not from the UK? It seems you are saving a lot of money with that membership. Anda – I hope you get to visit the Cliffs too. Unfortunately, the shortest time period you can join the National Trust is for 1 year. I think it is 46 GBP so you would have to visit more than just the Dover Cliffs to make it worthwhile. Omgosh, I wish I had known about the WWII tunnels when we visited! That would have been fascinating to learn more about! Will definitely try to do that next time I’m near Dover! #TheWeeklyPostcard! Lolo – They have only let people visit the tunnels the last few years. It is definitely worth going back for. Anna – I hope you get the chance to visit. It is too bad they don’t let kids in the Deep Bay Shelter but it is for safety reasons the stairs are steep. I think the Cliffs of Dover are almost a universal Bucket List item! It’s definitely on ours. We had never heard about the Deep Fan Bay Shelter. That looks incredible, and definitely something we’ll want to do. Pinning this one for later, hopefully not too much later! Rob – I hope you get the chance to go, I know you would love it!